Business continuity planning (BCM) today must create systems of prevention and recovery to deal with potential threats to a company that go beyond data recovery. Be it physical damage from massive weather events or terrorism, financial difficulty from unexpected economic events, or data and operational disruption from cyber-attacks or technological failure, the impacts can rapidly snowball to catastrophic levels. The need to plan for business operations and services to continue uninterrupted in the face of a catastrophic event is greater than ever before. Doing so requires coordination of risk management, compliance and internal controls across the extended enterprise – the very activities that are the center of GRC capabilities. 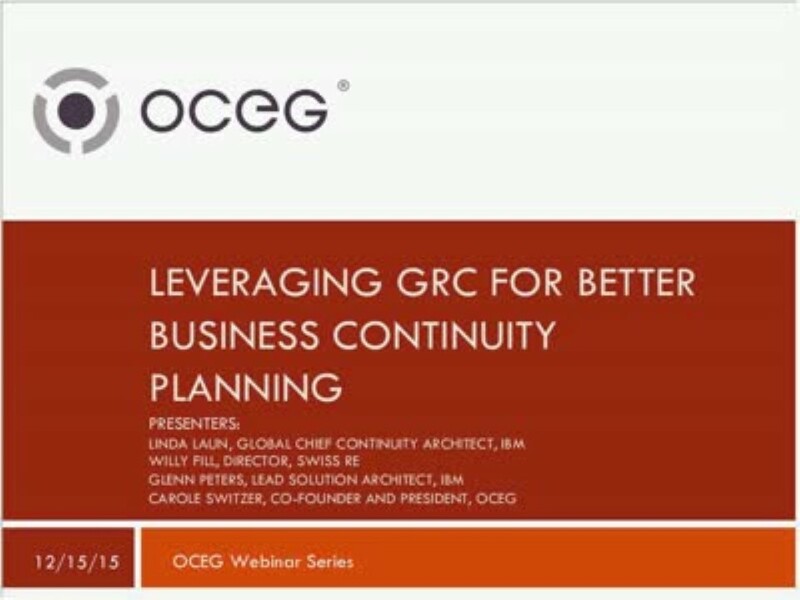 In the webcast “Leveraging GRC for Better Business Continuity Planning,” we address the ways forward-thinking organizations leverage GRC processes and technologies to support a more mature and effective BCM capability. Technologies for support of BCM in an integrated architecture that ensures real time assessment of changing risks and re-evaluation of needs as business objectives and strategies shift. We have emailed instructions to access Leveraging GRC for Better Business Continuity Planning to . Make sure the email arrives in your inbox: either add "support@oceg.org" as a safe sender to your email platform, or if you use Gmail, drag our email into your Primary tab.